Walking around downtown San Diego one night last week, looking for a place for, I spot a place on the corner called The Beer Company. It must have opened less than a year ago, since I didn't remember it being there last year. Intrigued, I walk in, sit down at the bar, and look at the list beer selections written on a chalk board, which consist of the usual Blond Ale/Pale Ale/IPA/Stout/Lager/Belgian Ale/ ect. tick list of styles. The interior is perfectly manicured light brown brick and mortar look, with fancy brass fixtures and an impressive looking stone bar table. I can't help notice all the young slender waitresses zipping around in tight black skirts with lacy trim. One of the black skirts stops in front of me and asks "What'll you have?" Seeing me struggling to come to a decision, she tells me "You should get the sampler, that's what everyone gets." I can't remember the last time I had a sampler flight at a brewpub, but it somehow makes sense and so order that. 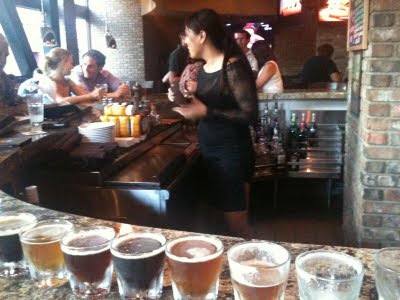 I then look around and see that nobody else is having a sampler flight. I work through the sampler flight drinking one maddeningly competently brewed beer after another. Each beer is true to its style, and is creative and imaginative as The Beer Company's name. I silently hope one beer actually tastes bad just to break the monotony, but no such luck. Now I could see myself enjoying a pint of any of these beers, but just can't remember any of them. I order the grilled salmon, and when it arrives, it has this dill sauce on top that tastes great. Finally. If anyone asks me about The Beer Company, I will say "They make beer." Ha ha! this is hilarious. Glad you enjoyed the salmon with dill sauce. The picture is perfect.